Star Wars quotes and references: A practical guide. 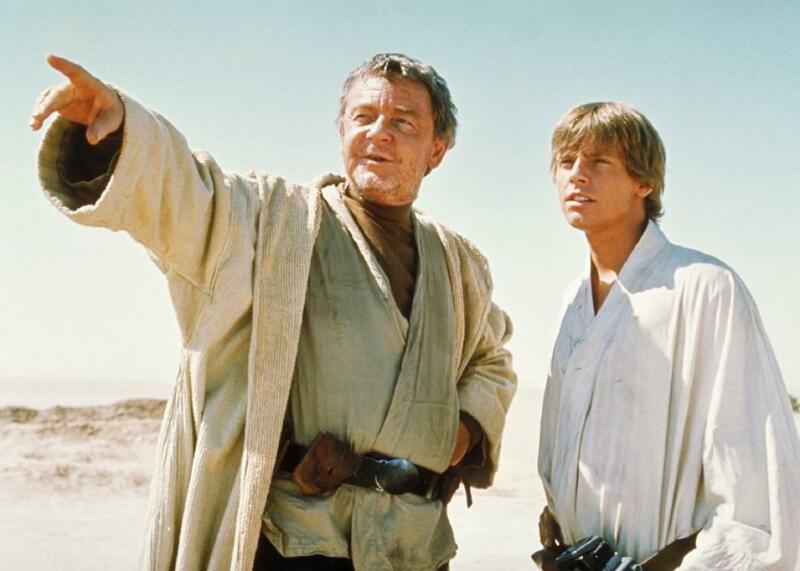 Uncle Owen, probably pointing Luke away from Tosche Station. © Lucasfilm Ltd. & TM. All Rights Reserved. The dialogue George Lucas wrote for the original Star Wars is famously wooden. But it’s good wood. For those of us who grew up on the film, the only thing more exciting than popping the tape back in the VCR for another viewing is quoting dialogue to a likeminded friend or loved one. In fact, there’s a Lucas line for just about every occasion. Here’s a guide to the best. Context: The bounty hunter bumps into his quarry, the debtor Han Solo, as the latter is slipping out of the Mos Eisley cantina. Real-life application: Useful when apprehending someone who has been avoiding you. Your husband has been promising to clean the gutters all week, and now you catch him ducking out to watch the game with his buddies. “Koona t’chuta, Solo?” you ask, an eyebrow cocked. For added effect, you punctuate the question by sticking a finger-blaster in his ribs. Context: Luke was planning to go into Tosche Station to pick up some power converters, but Uncle Owen scotches those plans by asking him to clean the new droids instead. Real-life application: When someone ruins your plans by asking you to do an annoying chore. You were planning to watch the game with your buddies, but your wife corners you and demands you clean the gutters first. “But I was going into Tosche Station to pick up some power converters,” you protest. Context: The captain of the ship carrying Princess Leia explains to Vader that his humble vessel is a consular ship on a diplomatic mission, not conducting secret Rebel business. The Dark Lord is unconvinced. Context: Han complains that Obi-Wan’s plan to escape the Death Star is a foolish one. Obi-Wan, as is his wont, replies with a proverb. Context: Rebel pilot Wedge Antilles beholds the Death Star from his X-wing fighter and blurts out “look at the size of that thing.” Red Leader reminds Wedge that the open channel is for tactical communication, not idle chitchat. Real-life application: Useful for keeping communications lines clear and subordinates focused on the task at hand. It appears that a tennis ball, likely flung onto the roof by your son, has lodged in the drainpipe. Months of sitting in rainwater have left it heavily layered in muck, now closer to a softball in girth. “Look at the size of that thing!” your husband exclaims. “Cut the chatter, Red Two,” you reply. Context: Having been sprung from her Death Star jail cell without a proper exit strategy, Leia takes matters into her own hands and encourages her would-be rescuers to take shelter in a pungent trash compactor. Han is not impressed with this plan. Real-life application: Any time someone’s actions, however pragmatic, lead you to experience a foul smell. It seems the tennis ball has prevented the proper flow of water through the gutter, leaving a stagnant pool of decaying foliage. “What an incredible smell you’ve discovered,” you call to your wife, who is watching safely from the window. Context: A Rebel Alliance commander has just outlined the plan for defeating the Death Star, which will require firing proton torpedoes into a two-meter-wide exhaust port. Luke used to bull’s-eye womp rats in his T-16 back home, and womp rats aren’t much bigger than two meters. He informs a fellow pilot of this. Real-life application: Great for any occasion in which you wish to express confidence in your abilities when faced with a difficult task. Try as he may, your husband can’t get a good enough grip on the ball to loose it from the pipe. Just enough of it is exposed above the roofline, however, that you reason that if you could fire another ball at it with enough velocity you might just be able to displace it. It strikes your husband as an impossible shot, and he says so. But you like your chances. Context: Luke has used the Force to guide his torpedoes into the exhaust port, destroying the battle station and saving the Rebel Alliance. Real-life application: Reserved for truly exceptional displays of heroism under trying circumstances. Your wife grabs a youth football from your son’s toy chest, closes her eyes, breaths deep, and lets fly a perfect spiral. It hits the sodden tennis ball with enough force that it is freed from the pipe, both balls bouncing harmlessly to the ground. “Great shot, kid!” you cry. “That was one in a million!” You climb back inside and the two of you retire to the throne room. Read more in Slate about Star Wars.